Chaz gave the okay to mention my blog on here, but since providing URLs in signature messages is not permitted, I figured the easiest way was just to put a single thread for it. If this should go in another forum, please kindly move it. Only a couple posts so far, but I am hoping to write a piece every week at least. One so far on hunger in the USA. Also of possible interest, me and a friend of mine just finished recording the first segment of a socialist podcast we have been discussing. We recorded a good two hours, and cut it down to a fairly focused 30 minutes. We dorked about a little for the first 2 minutes with our intro-"jingle" but the discussion is sincere and genuine. Once he's done editing it, I am hoping to have it online this weekend at the latest. We'll definately take suggestions and comments. THe first segment was about the financial crisis and the alienation of the worker and detachment of workers and economy in the present day. Next time, we'll talk about the eastern bloc and what elements should be looked at as positive and worthwhile to retain. okay, my friend who is doing the editing is having unemployment issues, so I will probably just upload the file as is this weekend. For your reading pleasure, I have a post today about imperialist atrocities. Read at your leisure. If I can remember to do it when I get off work, I'll link to you with my WordPress account. since there was another blog with almost the exact same title. I need to mess around with uploading images and stuff. This one I'll definately save for later though. Where does the 50 million communist thing come from? I don't know TBH and i don't think it's true (actually i made a thread criticizing that same picture a year or so ago ),you can edit it if you wish. This picture,while good in concept,is flawed and a new version should be made. TBH while your article is brilliant, I don't like that picture, I think we should criticize crimes of "socialists" like Stalin while criticizing imperialism as well. 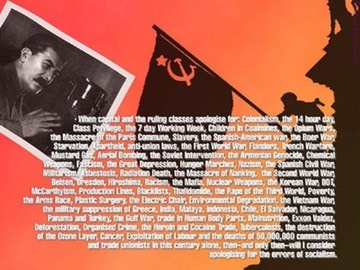 Not in the "he was a baby eating maniac who killed a billion of people" way, but in the "he was not the worst mass murderer in history, but his programme was not socialism instead it was more of a brutal primitive accumulation and industrialization campaign, with the horrible "side effect" being many deaths" way. Last edited by Neuron on 14 Dec 2011, 21:39, edited 2 times in total. It is kinda understandable through when you've seen a capitalist claiming Chernobyl disaster killed a million people and count it as a "communist/USSR crime" (seriously I saw this in a comment on 1 blog). Im kind of halfway on Stalin. On one hand, I think he did a lot of important things, on the other hand, he did a lot of bad things. It's almost always worthless to discuss Stalin with non-communists (and even many "new communists") because you are inevitably discussing the caricature of Stalin, not the actual deeds (good or bad). My point in the article is that even if you accept the wild claims of 100 million dead, even that pales compared to what capitalism has caused in just the 20th century. I don't accept the claim. Soviet archives suggest 1-7 million dead. Which is still "no thank you" level. "It is no accident that we recall these Marxist-Leninist conclusions from 1989 and 1990. The dynamiting of statues of Lenin was accompanied by an explosion of propaganda claiming victory over Marxism-Leninism. However, only the Marxist analysis was correct, was capable of clarifying the real social forces working under the demagogic slogans of `freedom and democracy' and `glastnost and perestroika'. Khrushchev started his destructive work by criticizing Stalin's errors in order to `re-assert Leninism in its original form' and to improve the Communist system. Gorbachev made the same demagogic promises to confuse the forces of the Left. Today, things have been made crystal clear: under the pretext of `returning to Lenin', the Tsar returns; under the pretext of `improving Communism', savage capitalism has erupted. " Neuron,it is the duty of Marxists to criticize Stalin from Marxist positions of course and using factual arguments. But you should know that the USSR becoming socialist was officialy declared,IIRC,only in 1936. Anyway,surely there was more to it than just the "primitive accumulation which caused many deaths"? If I can state my opinion. I'd let the picture alone for now. yeah, I dig the idea, but I'd want to change it up a bit. Suggestions for a topic for the weekend btw? Perhaps debunking the idea that the average socialist country was dirt poor? Some statistics are already in this thread viewtopic.php?f=130&t=51706 . That's something I've pondered actually, particularly after reading "Triumph of Evil"